Tarrant, Texas, Tarrant County absorbed ghost town. When the Chicago and Rock Island line extended across Tarrant County around 1903, it added a series of switches and spurs. One of these sites was named Tarrant and like many shipping points, a community grew around it. Within a few years a few businesses opened and a post office was granted (1905) but with the larger town of Euless just two miles north, hopes of growth (if they existed) were modest. But by 1915 Tarrant had 75 residents as well as a blacksmith; gin and drugstore. But Euless won out as expected and as people moved, the post office at Tarrant was discontinued in the 1920s. 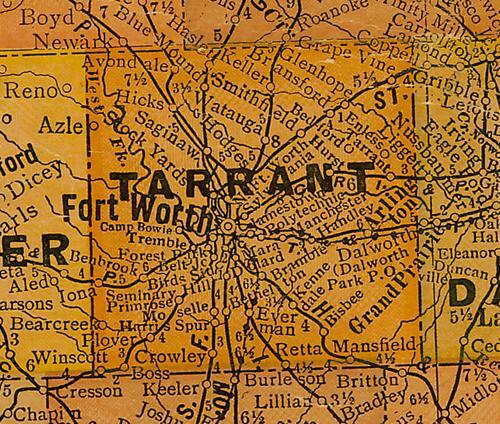 As the 1940 Census approached, Tarrant had become a part of Euless without needed an official proclamation of annexation.